May 29: What to do in the case of liquid sunshine? Rain is inevitable, so why not make the most of a rainy day? Believe it or not there is more to do than you think. You finally have a chance to relax! Or maybe take in a new film? What about visiting a gallery or museum or boutique? You shouldn&apos;t look at rain as a bad thing; look at it as a time to get ahead. 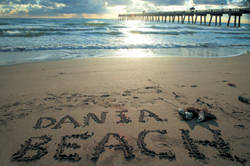 I grew up at Dania Beach. Ever since middle school, Dania Beach was the hot spot for me and my friends. It was a daily routine, get up and head to the beach.